It is with great sadness that the MOD must confirm the death of Lance Corporal Michael Campbell, from 3 Royal Welsh following an operation at Queen Elizabeth Hospital. It is with great sadness that the Ministry of Defence must confirm the death of Lance Corporal Michael Campbell, from 3 Royal Welsh, who died in Queen Elizabeth Hospital Birmingham on Thursday 23 July 2015 following an operation. © Sgt Calvin Maggs (1 Royal Welsh). All rights reserved. Lance Corporal Michael Francis Campbell enlisted into the Army Reserves on 23 April 2002 and joined D Company, 3rd Battalion, The Royal Welsh in Colwyn Bay. LCpl Campbell was mobilised in October 2011 to deploy with the 1st Battalion, The Royal Welsh on Operation HERRICK 16 as a Platoon Radio Operator in 2 Platoon, A Company. Whilst on patrol 03 April 2012 LCpl Campbell’s multiple was engaged by accurate, heavy and sustained enemy fire. During the contact LCpl Campbell was struck by a single round to the hip while crossing a road. The multiple returned fire and LCpl Campbell engaged the enemy firing position from the road. Despite being wounded LCpl Campbell continued to suppress the enemy drawing fire onto himself so that the remainder of the multiple could cross an open and exposed area to get into better cover. LCpl Campbell was CASEVAC’d firstly to Camp Bastion and then Queen Elizabeth Hospital in the UK. Prior to his deployment on Operation HERRICK 16, LCpl Campbell had deployed on a number of other tours. In 2004 he mobilised on Operation TELIC 4 as a member of the Anti-Tank Platoon with the 1st Battalion The Royal Welch Fusiliers Battle Group; in 2007 he mobilised to support the 1st Battalion The Royal Welsh, based in Cyprus, and deployed as part of the Theatre Reserve Battalion on both Operations HERRICK 7 & 8; in 2009 he mobilised again to support the 1st Battalion The Royal Welsh as the Aviation Assault Battle Group on Operation HERRICK 11. On all of these tours he proved to be a highly capable soldier and was consistently commended for his maturity, professionalism and dedication to his fellow soldiers and his Regiment. Through his dedication and determination he demonstrated the perfect example of a Reserve soldier seamlessly integrating into a Regular Unit. LCpl Campbell epitomised everything a Reservist in 3 R WELSH should be; dedicated, professional and willing to volunteer on operations wherever he was required; a true Welsh Warrior. The Battalion has lost a charismatic and loyal friend and our thoughts and condolences are with his wife Chrissie and his wider family at this very difficult time. Everyone who served alongside LCpl Campbell in Afghanistan in 2012 will be devastated to learn of his passing. He joined the battalion during our pre-deployment training and fitted seamlessly into his platoon and company. He was an outstanding soldier and very talented junior commander: skilful, determined, measured and very courageous: he set an excellent example to those around him. It is tragic that he has died three years after his initial wounding and the thoughts and prayers of all of us are with his family at this most difficult time. I was deeply saddened to hear of the tragic loss of LCpl Campbell yesterday. I had known him for a number of years; he was a true reservist with a huge amount of operational experience under his belt. A larger than life character always upbeat, at the heart of things and looking for the next challenge. He will be sadly missed by all his friends and comrades in the 3rd Battalion The Royal Welsh. LCpl Campbell joined A Company 1 R WELSH in the build up to Op HERRICK 16 and conducted the Mission Specific Training with the Company before deploying in early 2012. He immediately forged his role within the Company; in fact given his previous experience he was key to integrating some of the other members of 3 R WELSH into the Battalion. LCpl Campbell was a veteran of Iraq and Afghanistan having completed a number of tours with the Regiment before deploying in 2012. He was a superb example of a R WELSH Reservist, demonstrating true passion for his job. He was deeply committed and keen to show the strengths he could bring to his Platoon. Although he specialised in communications he was able to fulfil any role within the Platoon to which he was attached and proved himself to be a very valuable asset; in short he was an outstanding soldier. Not only was he an excellent soldier but was one of life’s true characters. One of the reasons that he was able to fit seamlessly into the Company was his keen sense of humour; he excelled at the banter which only soldiers seem to understand. He was always quick to offer advice and the benefit of his experience to anyone, rank was no barrier. LCpl Campbell’s loss will be felt deeply within the Regimental family, especially as he was so far down the road to recovery but our loss is nothing compared to that of his wife and family. My thoughts and prayers are with them at this difficult time. Reliable and professional are the two words that spring to mind when describing LCpl Cammy Campbell. Having served in both Iraq and Afghanistan, in a total of four tours, he was one of the most experienced soldiers under my Command. Cammy was the Signals Detachment Commander, he ran the Company Command Post. His Command Post, as he quite often reminded me! A larger than life character, Cammy always brought a smile to your face with his wit and cutting sarcasm and he was always on hand to pass on his experience to the new, and not so new, members of the Company. When I learnt that he had volunteered, yet again, to deploy on what would be his fourth tour, I told him that he had done enough already, his reply was “Well someone has to go and look after you, Boss”. That is what Cammy was truly about. He was a team player, who was committed to serving his country. LCpl Campbell was a valued member of the Battalion and more importantly D Company. He will be sorely missed. LCpl Campbell will be sorely missed by all members of the Royal Welsh. 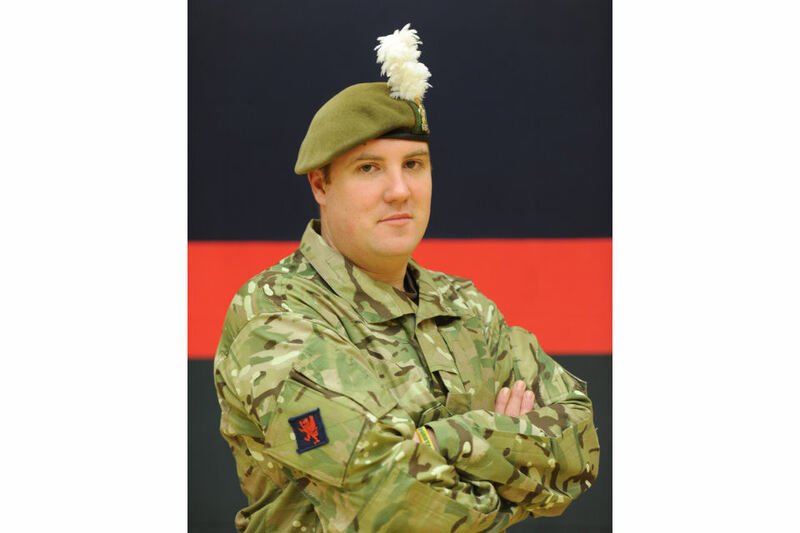 He was a dedicated Reservist who was truly loyal to the Regiment and deployed on all Iraq and Afghanistan deployments conducted by the 1 R WELSH. Every time he deployed he fitted seamlessly into his Platoon and Company due to his hard work, determination, professionalism and sense of humour. On top of all of this he was simply a ‘top bloke’ who everyone wanted to be mates with. I had the privilege of working closely with LCpl Campbell on a number of tours and his professionalism and knowledge was excellent, often putting his Regular counterparts to shame. The only thing he loved more than being a Royal Welshman was his family and my thoughts are with them. I had the privilege of meeting LCpl Campbell on a number of operational tours in Afghanistan. As soon as he became part of 2 Platoon, he put himself forward to be the Platoon’s Radio Signaller and did a thoroughly professional job throughout his time with us. During pre deployment training he not only became a key asset for the Platoon but a very respected and well liked individual. He was always smiling and was a thoroughly professional lad. All of 2 Platoon and anyone who had the great fortune to meet him will miss him sorely. I was privileged enough to have served with Michael in D Company, 3rd Battalion The Royal Welsh. A highly motivated, dedicated and professional Soldier, he was always the first to volunteer. He had truly found his calling in life. His knowledge and enthusiasm rubbed off on all around him, especially when guiding the younger members of the Platoon. Affectionately known as “Pudding” after his time with the 1st Battalion, The Royal Welsh, Michael was a big part of the Company. He was hugely proud of being a Royal Welshman and even more so of his family. A better man you could not find. My thoughts are with Michael’s family at this sad time in their lives. A true Royal Welshman, a true Delta, a true hero. LCpl Campbell a friend and colleague, who served his country on several tours of duty. A dedicated and loyal soldier. Mike gained a wealth of knowledge throughout his career as a Reservist. He always passed on his experience gained on tour, to his fellow soldiers when he returned. A resolute and robust soldier who completed the Cambrian patrol, despite picking up an injury towards the end, he refused to give up as he didn’t want to let the section down and earned a silver medal. He will be missed by all and my thoughts are with his family and friends at this difficult time. I met Mike or “Pudding” as some know him in the Army Reserve, he was a man of big stature and presence and a go-to guy! His grit and determination to succeed, even through his injury was inspiring; his thoughts were for other people and their welfare before his own. Even though the military was a big part of Mike’s life, his real passion was his wife Chrissie and their family. The tributes of his comrades describe LCpl Michael Campbell as a popular and committed soldier devoted to his Regiment and a dedicated family man. Proud and professional, he epitomised the ethos of the Army Reservist and he had completed numerous tours duty in Afghanistan and Iraq. It is particularly tragic that Michael Campbell should die of wounds after such a period of time and I send my deepest condolences to his family and loved ones at this sad time.